LeRoy Anderson’s New Book “Joie De Vivre” is an Enlightening and Captivating Biography of the Author’s Ancestry Over Three Generations. Recent release “Joie De Vivre” from Page Publishing author LeRoy Anderson is both cultural and emotional; this work depicts 150-years of history and ancestry. 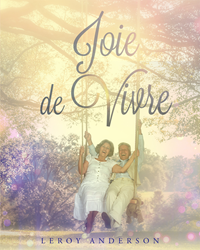 LeRoy Anderson, a husband, father, grandfather, retired bank senior manager, traveler, gardener, photographer, devoted writer and author, has completed his newest work “Joie De Vivre”: a passionately crafted and vividly illustrated work of non-fiction. Published by New York City-based Page Publishing, LeRoy Anderson’s profound work intertwines the author’s current life with the history of his family. Here is the chronicle of the Anderson family, Post Bellum (Civil War) Scandinavian settlers to America. They were the author’s grandparents and triggered this interesting story of the three following generations over a span of 150 years. The story is compelling, forthright and, indeed quite readable and witty. Grandpa Olander leads the parade of memorable family. His seven offspring included Navy Chaplain, Captain Paul, an exuberant fellow who charted new paths around the world aboard the SS Boise during WW II and emulated St Paul in his post-war missionary work in Greece and Turkey. Author Anderson narrates an unusual family history based on a varied community banking career laced with many collateral and cultural interests in music, travel, church, sailing, camping and gardening. Their multi -9 home- residency to accommodate the author’s career provided lots of color for the many vignettes of their personal lives. Then there are those wonderful three children and five ‘above average’ grandchildren who play an integral role in the family and world. The author’s wife, Claire, is a pleasant and comely – but quiet – supporter of all that activity from her first unusual introduction that led, ultimately, to the altar and many years of marital bliss. That saintly partner introduced the author, nee husband, to quite interesting characters who garnish this story in spades. Those ‘walk-ons’ provide a compelling, and often, humorous backdrop to the ‘larger picture’. “Joie De Vivre” abounds with incredible and diverse photos that follow each chapter. Their composition and captions are well thought out and interesting. Thus, the whole work is a delightful journey of two people in love – hubby Roy and dearest partner, Claire – for over 60 years and still counting. Readers who wish to experience this mesmerizing work can purchase “Joie De Vivre” at bookstores everywhere, or online at the Apple iTunes store, Amazon, Google Play or Barnes and Noble.